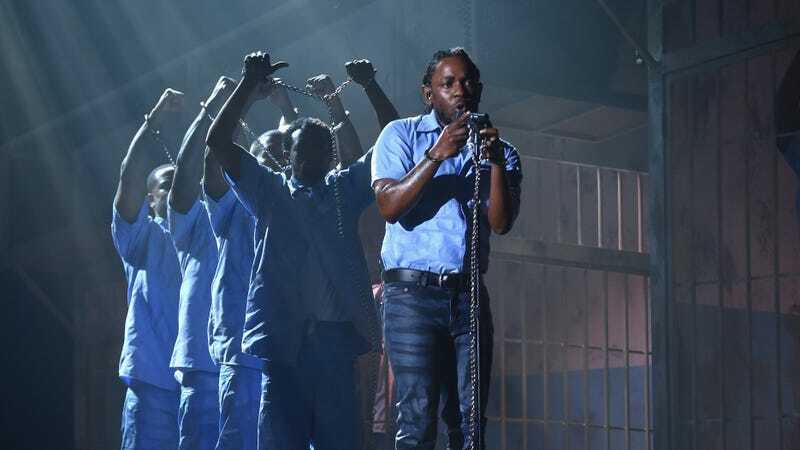 In 2016, Kendrick Lamar destroyed the stage at the Grammy Awards with a (somewhat literally) fiery showcase before going home with trophies for Best Rap Performance, Best Rap Song, Best Rap Collaboration, and Best Rap Album. He might be looking for a repeat this year, with Billboard reporting that Lamar will open the 60th Annual Grammy Awards later this month with a performance that will most likely feature from standouts from Damn.—or maybe a tease for his work on the Black Panther soundtrack. In addition to opening the show, Lamar is also up for seven awards, including Best Rap Album, Best Rap Song, and Record Of The Year. Lamar aside, Billboard says that Sam Smith and U2 will also perform, and Miley Cyrus will join Elton John for a tribute as he receives the 2018 President’s Merit Award. The Grammy Awards will be held on January 28, and they’ll air on CBS.